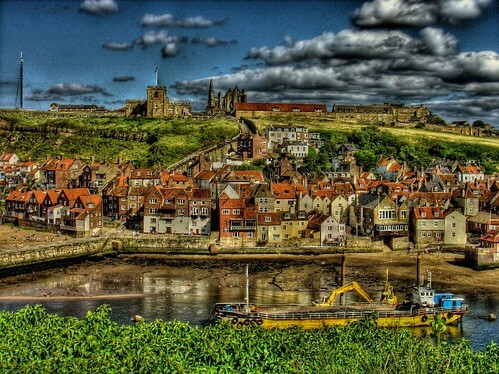 2007-08-07 Whitby HDR, uploaded into Flickr by sayzey. Click on pic to see it in Flickr. I am back from a brief trip without posting ability, so its nice to get back to it. Noise can result from HDR processing, and it can be a two edged sword...it can give a shot a dreamy look, but also make it appear too artificial. I think the photographer on this one admits to some noise problems with this shot and the halo next to the flagpole, but, on balance, it is still compelling and has that gaze-grabbing quality to it. I like it. GOTTA SEE IT IN LARGE ON BLACK.